Ohyo is based in London with manufacturing in Sheffield. We create products that make people's lives easier with sustainable products. We created the multi-purpose Ohyo Bag and Ohyo the Collapsabottle to do exactly that. The inspiration behind these products was the waste of one trillion plastic bags per year and enough plastic bottles to circle the earth 1000 times. Ohyo has developed the Ohyo Bag that grows with your day. I came up with the multi-purpose bag when my workbag was never big enough for the groceries I buy on the way home forcing me to buy plastic bags. Furthermore there's only one thing worse than a bag of plastic bags under your sink, and that's a bag of re-usable bags that you never remember to take with you! 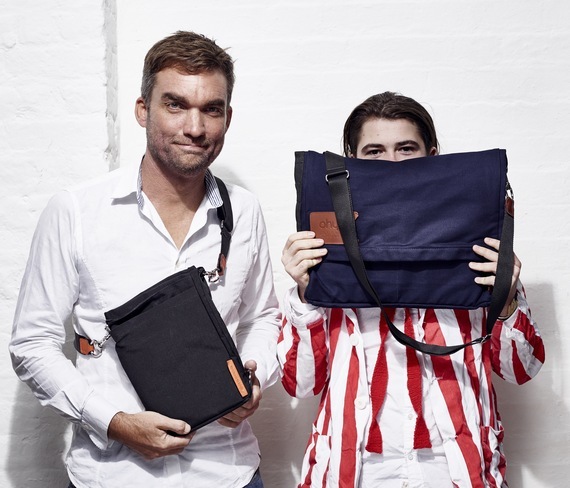 I took the problem to London Designer Felix Conran (Grandson of Sir Terence Conran), and from there the Ohyo Bag was formed. The Ohyo Bag saves resources by limiting the waste of plastic bags and saving people buying four different bags when one will adapt to all scenarios. The Ohyo journey began 7 years ago when I found myself at St Pancras station with no water fountain in sight, no bottle in my pocket, and no option but to buy a bottle of water. I concluded that people are reluctant to carry re-usable bottles because they are too bulky. I invented Ohyo Bottle as a handy, collapsible water bottle that's easy to take anywhere and extend to fill from a fountain. Using just one bottle reduces the amount plastic in landfills and saves money with each use. An Ohyo Bottle is no use unless you can find somewhere to fill it, so in Summer 2009 we cycled round London looking for fountains and established a free app for users to find drinking water sources near them. We are looking to our users to upload more fountains around the world! In 2010 armed with a prototype bottle, a great story and a handful of initial sales, I ventured into BBC Dragon's Den. Yes, I asked for a lot of money for a small percentage of the company - but that's just part of the game isn't it? My pitch was really quite good and in the two-second pause before the Dragons laid into me I thought everything was going well! "A LUDICROUS invention" Duncan Bannatyne as he hurled an Ohyo at me. I left with no cash, some great PR and no regrets. With almost 700,000 bottles sold to date and the team's equity intact, why would I? Likewise in September '15 I ventured into Dave TV's Money Pit hosted by Jason Manford to pitch the Ohyo Bag. Whilst I didn't quite hit target, the 30 investors loved the pitch, and had I offered equity in Ohyo, not just rewards, we would certainly have secured investment. Never-the-less we repeated the reward-based exercise on Kickstarter and smashed our target in just 4 days! Ohyo Bag is available online, and the journey now begins to launch our new Spring Collection globally through retailers and distributors. Ohyo has certainly been like a game of snakes and ladders over the years. But with more ladders than snakes, we're certainly on the way up! Adessy Associates believes a better world is possible, and inspires and equips organisations and individuals to make positive change happen and contribute to a sustainable future, for the benefit of people, planet and profit. Our bespoke services harness sustainability, innovation, consciousness and purpose. We are B Corp certified. Guy is an environmental entrepreneur. He co-founded JP Envirosystems in 1999 as a new visual approach to company Environmental Management Systems. He sold the business to The Waterman Group in 2005 and his system now thrives as Greenspace. The environmental damage caused by the bottled water industry had always been a bugbear to him. This led him to establish Ohyo and Find-a-Fountain to make drinking tap water easier.